Arming teachers is supported by 72 percent of Republicans. The idea is opposed by 61 percent of Democrats. Half of voters are with President Donald Trump in his call to arm teachers in order to respond to a school shooting, while a majority of Republican voters support stricter gun control laws, according to a new Morning Consult/Politico poll. 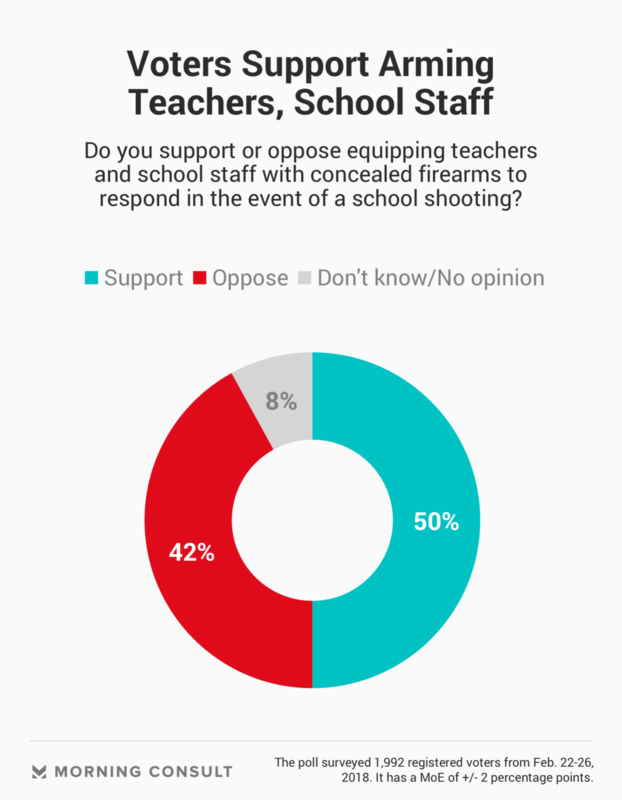 The survey, conducted Feb. 22-26 among a national sample of 1,992 registered voters, found 50 percent of those polled support equipping teachers and school staff with concealed firearms to respond in the event of a school shooting. Forty-two percent of voters said they do not support such a policy, which Trump has embraced following the Feb. 14 high school shooting in Parkland, Fla. The poll also found support for stricter gun control laws has risen 4 percentage points, to 68 percent, since a Morning Consult/Politico poll conducted Feb. 20, while the share of those opposing stricter laws dropped 5 points to 25 percent. 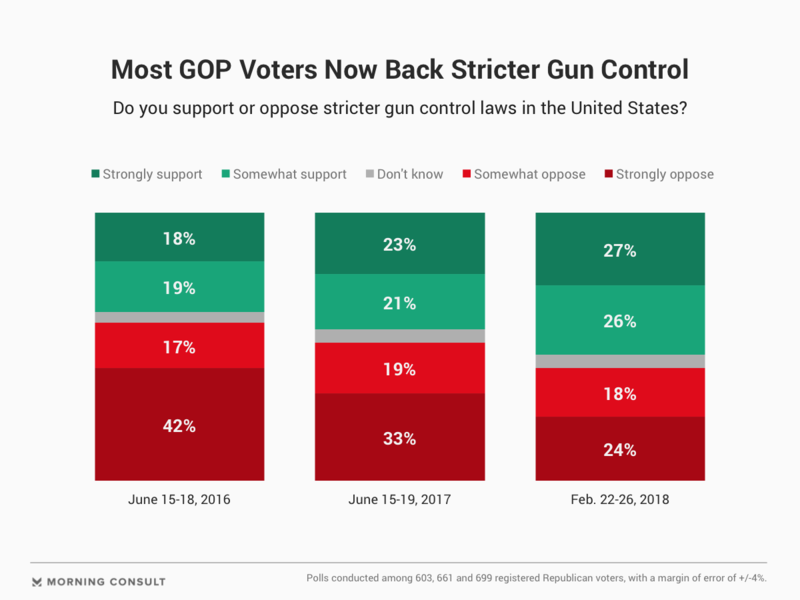 Republican support for stricter gun laws is now at 53 percent, up 8 points from last week’s poll. The most recent survey has a margin of error of plus or minus 2 percentage points. Along with arming some teachers, Trump, who said Monday he met with National Rifle Association leaders over the weekend, has voiced support for gun control measures such as strengthening background checks, raising the purchasing age from 18 to 21 for certain firearms and banning bump stocks. Michael Steel, managing director at Hamilton Place Strategies who served as press secretary for then-House Speaker John Boehner (R-Ohio), said in a Tuesday phone interview he thinks some of the proposals floated have been “thinking aloud.” But he suggested there is a chance for policy to be enacted after Parkland, particularly on background checks. “I think because of the president’s extraordinarily close relationship with the NRA and his enormous credibility with base GOP voters on this issue, particularly strong in rural areas, I think he has the opportunity to get something done,” Steel said. Chris Latvala, a Republican in the Florida state House, said in a Tuesday phone interview that Trump “gives Republicans cover” to support gun control measures when he expresses his own support for them. Florida lawmakers are considering several measures in response to the tragedy in their state, including a proposal by Gov. Rick Scott (R) to raise the purchasing age for rifles and shotguns to 21 years old. Latvala is not alone among Republicans: Seventy-two percent of GOP voters surveyed support arming teachers, while the proposal is opposed by 62 percent of Democrats. Thirty-one percent of Democrats support the policy, while 22 percent of Republicans oppose it. Becky Pringle, vice president of the National Education Association, said teachers, other educators and students have said arming teachers is not going to stop the problem of school gun violence. Correction: A previous version of this story misstated the following: level of voter opposition to arming teachers; Democratic support and backing for the proposal; and level of overall voter opposition to stricter gun laws. It also mischaracterized the level of GOP support for stricter gun control laws. Clarification: This story has been updated to clarify that Trump has voiced support for raising the legal age for purchasing certain firearms. This story has been updated with a new graphic.